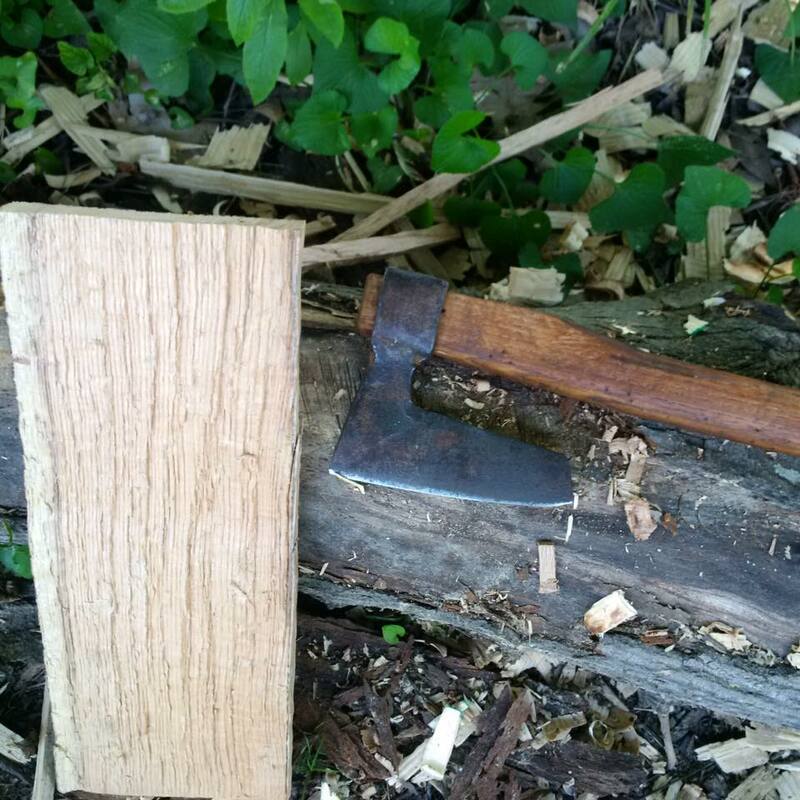 Today I decided to beat the heat and stay in the shade while completing a project involving putting a helve in a small bearded hatchet that I will use in future Ozark traditional woodworking demonstrations. The Ozark Border was logged off by huge lumber companies in the 1880’s and 90’s, leaving a wasteland of scorched earth after wildfires consumed thousands of acres of treetops and underbrush. Circa 1900 the ravaged land could be purchased for fifty cents per acre. Many families came to this land from Latvia, Lithuania, Poland, Czechoslovakia, Bulgaria, and Hungary through Ellis Island and started a new life in the wastelands left by The the lumber barons. They brought with them their cultures, languages, music, and tools that were very alien to the Scots-Irish base population. When I was a child I marveled at their tools, particularly their axes which looked so different than the ones my family used. Over the years I was able to acquire quite a few of the tools brought from The Baltic States and continue to restore and learn how to use them. It was time to haft a little hatchet and get it ready to use to inform the public of the migration of a population that has fully blended with the Ozark lifeway. In the restoration of the little hatchet I left as much of the patina on it as possible and sharpened it so it can be used. I start many projects with an axe or hatchet rather than a saw. It is the old expedient way of working wood I learned many years ago. A piece of rived wormy ash was selected for the helve. The bearded hatchet is rather small and weighs a little over a pound. The ash was shaped with spokeshaves. The final smoothing was done with a steel scraper and two pieces of broken glass, one flat and one curved. In order to achieve a rich brown color for the helve, I used a wood dye that is water based. This photo shows the freshly dyed helve. The dye dried quickly and I then saturated the wood with an oil finish. Next I prepared the end of the handle to receive a poplar wedge. This photo shows the wedge driven part way in as a test. I sharpened the cutting edge with a diamond file and honed it to completion with an axe stone. After sharpening, I mounted the head and drove the wedge home. A flush-cut saw I made was used to cut off the wedge. I never use glue on a wedge. If the head were to loosen in the future, the wedge can be driven in more. This photo shows the vee and the wedge driven into it. Next, it was time to give the little hatchet a test run. 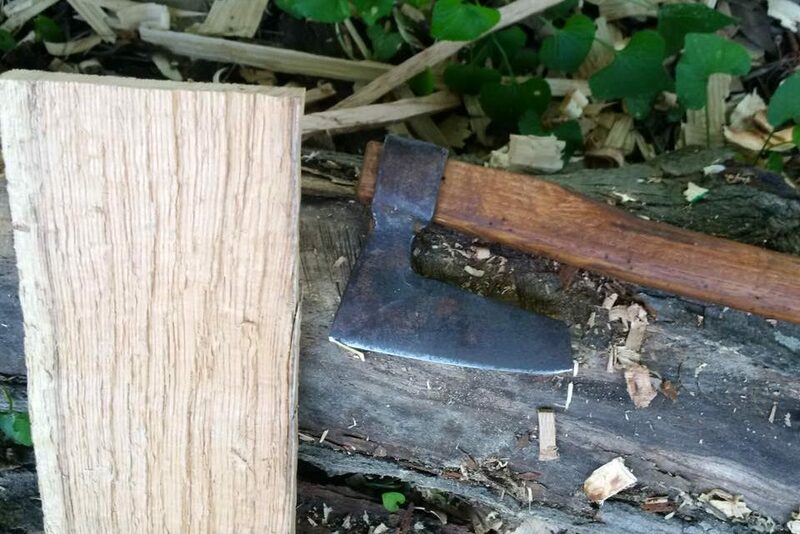 I make lots of things out of rived red oak boards and this little hatchet will be great for cutting those boards to size. The hatchet has the correct balance and I rapidly wasted wood away. Then I hewed very close to the line and will use a jack plane to do the final true edge.